Archaeological sites, many in caves, have revealed stone tools belonging to Neanderthals and to early modern humans. Scientists have now used a new technique to detect CI cryptotephra in some of these sites across Europe and in Libya – the lighter particles of the glass means it spreads over much wider distances than ash. 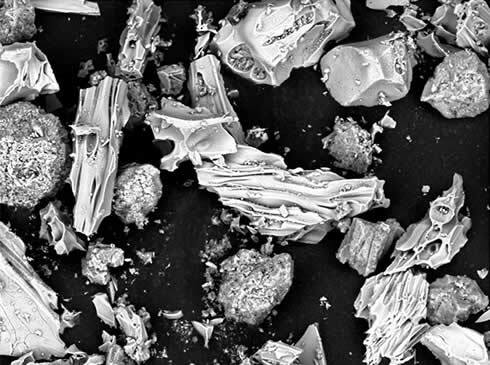 Microscopic particles of volcanic glass called cryptotephra. © Suzanne MacLachlan/BOSCORF/National Oceanography Centre, UK. The team of more than 40 scientists, including Prof Chris Stringer and Mark Lewis of the Natural History Museum, published their research in the Proceedings of the National Academy of Sciences last week. They found that the CI cryptotephra lies above, and so is younger than, the layers where modern human stone tools began to replace Neanderthal stone tools, in 4 central European sites. This means that the Italian eruption happened after the Neanderthals had already declined and so it couldn’t have been the cause of their extinction. The team says that the CI volcanic eruption, and severe climatic cooling that happened around the same time, did not have a lasting impact on Neanderthals, or early modern humans. Modern humans had already arrived in Europe by 40,000 years ago, and posed a greater threat than natural disasters to the survival of other humans living there, they say. The issue may have been increased competition for resources, with modern humans being better able to take advantage of their surroundings. Or possibly conflict – genetic studies suggest there was certainly close contact between Neanderthals and early modern humans who left Africa, including some interbreeding. Either way, it is looking more and more likely that modern humans were implicated in the demise of the Neanderthals.